With increasing fuel prices and fuel economy hot on the agenda, Toyota's UK division has set up a challenge for owners to drive Toyota hybrid cars. The purpose is for drivers to put the fuel efficiency of Toyota’s Prius and Auris hybrid to the test in a challenge to see who can achieve the best mpg. Toyota centres across the UK are hosting the competition, each with their own set route and time limit. ﻿﻿﻿﻿A leaderboard will keep track of the local results, with prizes going to each centre’s best-performing entrant. 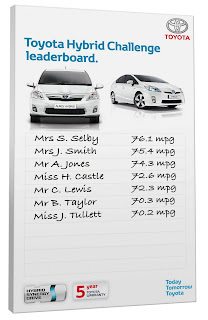 Official combined cycle figures are 72.4mpg for Prius and 74.3mpg for Auris hybrid, but significantly better consumption has been recorded for both models in independent economy drive events. The challenge runs until 1st May, coinciding with a new nationwide ad campaign which is using TV, billboards and print and digital media to spread the word about Toyota’s world leading technology.